We are eating colorful meals to celebrate the end of summer produce. These photos highlight some of the best-of-summer from our lives this year. We were lucky to get in a trip to Guatemala where we ate tortillas in cities of colorful plaster walls & wild looking begonia vines. Long, bumpy rides through the jungle in a pickup truck to reach a river oasis. Swimming through dark caves with no lights, holding only a candle, and jumping into pristine blue pools of Neverland. Hiking up active, smoking volcanoes and toasting marshmallows over hot pockets of lava. Ahhh. Guatemala. Enough already, just go. The people are lovely, the country is beautiful, and the food is delicious. Perhaps the most famous folklore legend of Guatemala is the story if El Sombrerón. It is a story based around the idea of a boogeyman... but one that it a bit more magical and in-a-way romantic. Although I enjoy the story itself, the lesson of the tale is one that is drenched in traditionalism. Lessons for daughters that bad things happen to them when they go off with men in the night. Reguardless, El Sombrerón is an interesting character. Below is a little information about El Sombrerón - gathered from Wiki. This character's main characteristics are always the same: a short man with black dress a thick and brilliant belt; he wears a black, large hat and boots that make a lot of noise when he walks. He likes to mount horses and braid their tails and manes. When he cannot find horses, he braids dogs. He also likes to court young ladies who have long hair and big eyes. When he likes one in particular, he follows her, braids her hair, serenades to her with his silver guitar; but he also puts soil in her plate and she is not able to eat or sleep. El Sombrerón appears at dusk, dragging along a group of mules carrying coal, with whom he travels around the city and its neighborhoods. When a woman corresponds to his love, he ties the mules to the house's pole where she lives, unhooks his guitar and starts singing and dancing. Some residents from the neighborhoods of La Recolección and Parroquia Vieja say he still wanders at nights when there is a full moon. Plums - I used about a generous pint, about 2 cups once cut in half & pits removed. Prep your garlic, ginger, onion, habaneros, and plums. Place oil in a medium saucepan over medium heat and add garlic, onions, and ginger. Let cook, stirring frequently, until everything is fragrant, soft, and translucent. Cook for about 10 minutes and then add habaneros and plums and cook for another minute or two. Add water and then the spices. I put the spices into a tea bag (or tea) ball to steep. Cover & cook until everything is soft, bubbly, and very fragrant. Another 10 minutes. Remove spices & turn off the heat. Add in the liquids of soy sauce, mirin, and honey. Stir until combine & then transfer into a blender. Blend until smooth & then set aside until later. Radicchio (or other lettuce) - 1 head. Honestly, I thought the radicchio was a bit too spicy for this dish and that it would work better with a sweeter cabbage or iceburg. Chop up all the vegetables. Place oil in a large skillet and place over medium-low heat. Add in garlic and shallots, cook for a minute. Add in the tempeh and cook for 5-6 minutes until starting to brown. Add in the water chestnuts, sweet peppers, and water chestnuts. Stir and cook for several more minutes. Add in peanuts & stir. Toss in the tamari and stir. Turn off the heat. Take the head of lettuce or radicchio that you are using and slice it off the base and gently peel it off the head, so that each peeled lettuce head makes a "bowl." I did not know what to expect when I asked my shadow the question. I did not even know if it would work. It was the book that convinced me to try or that is my excuse. Truthfully, it was my longing for something unrealistic to be... not so unrealistic. If I did not work in a library where more books than I could ever possibly read surrounded me, I would never have found the book; the book that led me to the question. I couldn't help but wander long silent corridors and sweetly brush my fingertips along the spines of hardbound books. In lonely corridors I would break dust for the first time in decades. The pleasant dust, a crisp crust on fine crème brûlée. Inside a library, your mind wanders. It is suppose to wander. As an employee, the library's silence, the endless comfort of rows, the organization, it either becomes a meditation provoking thought or something that stirs chaos. On the day I found the book, I felt its draw, like a beacon shinning out from the sea of muted books. It was a dusty gray color, the color of muted night sky. The book became a secret I harbored. I could see its history on the backside of the front cover. I always feel a little pity when I discover a book like this one. A book whose existence no one knows of or an existence long forgotten. The inside cover was white, virgin, no inked dates to mar its page. The book's knowledge was all mine and I felt its gratitude. This book was not the type of book the people in my community want me to read. It made the secret dangerous and intoxicating. It was called Nyx. It is a book dripping with modern magic and Greek mythology. I would take the secret out underneath the apple groves that dotted the Utah landscape and read listening to the sound of irrigation runnels. Everything would become still in those hours, so still I became part of the landscape. The deer treated me as they did the apple trees, a solid object, part of nature. I read for days about gods and goddesses of Greek mythology and the way those concepts and ideas have translated into modern life. Something I never learned before, it did not exist in my world. I was astonished that the ancient Greeks believed in these gods. It was not the incredulousness of these gods but the impressiveness of the things Greeks did to show their affections and loyalty; the things they built! I could not help but feel cheated. How exciting would a world be when filled with mythical creatures, gods who shoot arrows of love, nymphs, goddesses... and a world with scandals between gods and mortals? Even if these gods and goddesses were not real, the attentiveness of the Greeks made them real. I began to wonder about the realities of my own world and the one God that I worship and if someone would discover a book about my beliefs and my God 2,500 years from now. In Nyx the author discussed rituals and practices of the Greeks. There was one bit that stuck with me and my brain grew with questions. One question led me to my shadow. A shadow is not just one thing by itself; it is many things. It is light, it is dark, it is the ground, it is you, and it is air. The landscape in this combination is air. Air in Greek mythology is not necessarily one god. Air is the space where everything happens and it is the oldest of all gods, it is Khaos or as we know it, chaos. Shadow has been with everyone, at all times. It was there 2,500 years ago when the Greeks lived and it is here with you now. Think of all it has seen, all of the places it has been, all the space it has occupied and all the chaos that has passed through it. Filled with questions and too dark to read. Despite what you believe, you know the powers of a full moon, or at least you are aware of the myth. If I told you the full moon produces a special kind of shadow would you believe me? No? You want to believe me don't you? That is how I feel when reading the book. I want to believe everything. Something so different from my world, something to pull me out and take me away. There is not one specific idea that convinced me I could ask my shadow any question I wanted under the strength of a full moon and in return, I would get an answer. It was more an accumulation of knowledge and feeling. Ideas put into practice. I felt my evenings in the apple grove grow more powerful as the moon waxed. I wanted to ask my shadow is magic is real, if myth was real.... and if it was there was it would be myth no longer, it would be chaos. My life as I know it turned on its side and my realities lost. I wanted that. On the night of the full moon I wandered into the apple grove, my shadow faithfully trailing me. I asked my question. I won't tell you what happened. All I can tell you is that your realities are what you make them. I toss you my apple, I give you the chaos of asking questions. 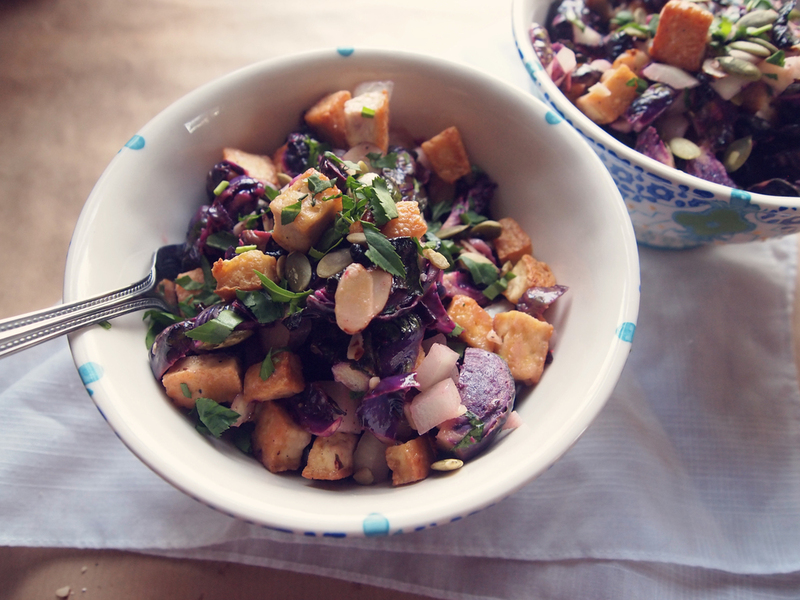 I can't explain how much I love this salad. It is inspired from my favorite salad in a little greek restaurant near my parent's house. I love to eat it by itself or wrapped up in some flatbread. Or eaten with a side of flatbread & hummus. Make it your own. It may sound simple but, seriously, it doesn't need any pity :). Toss together all ingredients & kind of gently massage the greens with the juices & herbs. Eat right away... or it tastes even better after it sits in the fridge and the flavors infuse for 15-30mins or so. Enjoy. Right, right, I know, I know, its 4th of July... I'm suppose to give you some grilling out masterpieces for you last minuet scrambling of grilling out plans and corn on the cobb marathons! Alas, I am doing the same thing, and decided to give you this recipe I made a little while back when I saw this salad in bon appetite. There is plenty of summer left for more grilling recipes and veggie burgers, in fact, we are just getting started. 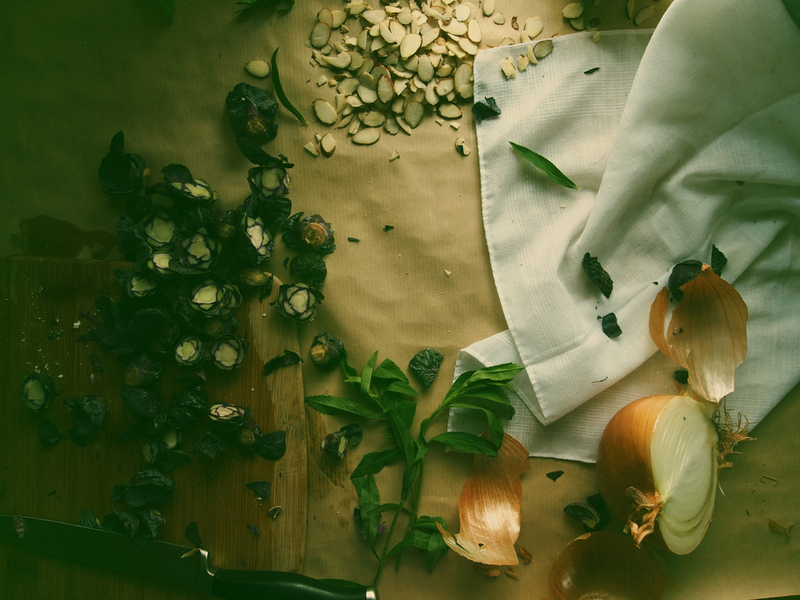 Place all the pesto ingredients into a food processor or blender, with 2TB olive oil. Blend until smooth, drizzling in more olive oil as needed until it is smooth. Rip the mozzarella into pieces and add in 2-3TB of pesto and massage the pesto in until the mozzarella is covered. Place 1TB of olive oil in a skillet over medium heat and toss in the asparagus pieces. Cook for about 5-8 minutes until soft and squeeze in the juice of a lemon. Then sprinkle with salt and pepper. 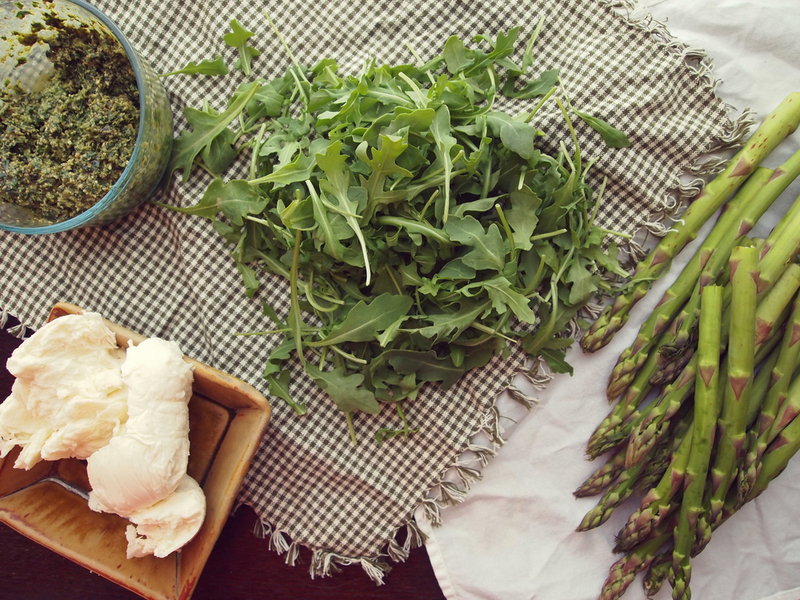 Turn off the heat and then toss the asparagus in a bowl with the fresh arugula. 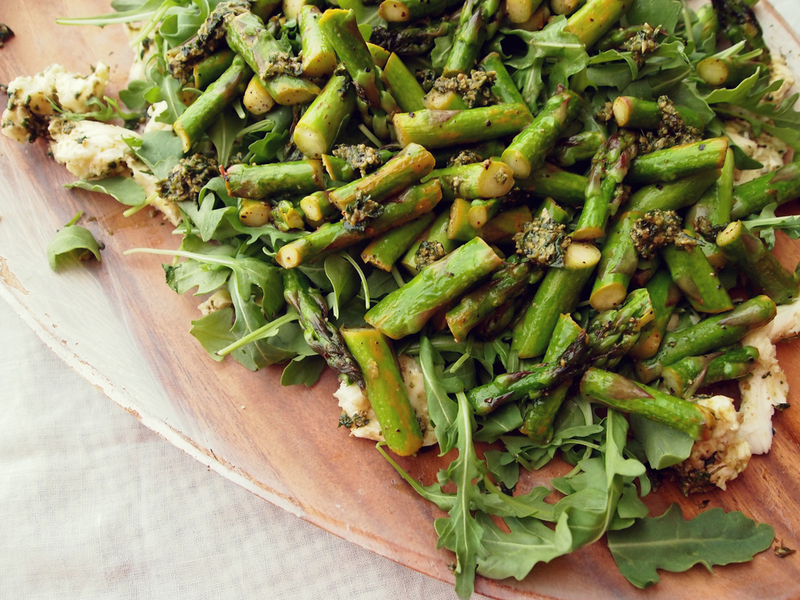 Spread the arugula and asparagus over the mozzarella and then sprinkle with a bit more pesto and salt/pepper or lemon if needed. 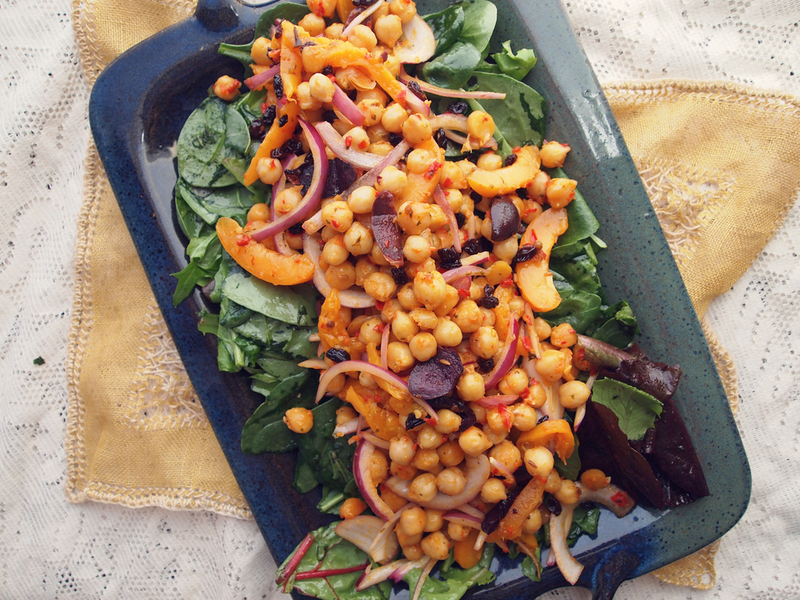 Moroccan inspired salad with harissa chickpeas, apricots, & a honey-mint dressing. Today is a beautiful day. A beautiful day for human rights, a beautiful day outside, and a beautiful day in life events. Plus, I have a lovely friend coming to visit all the way from Athens, GA, so I have a beautiful next couple of days to look forward to. I hope your day is beautiful as well and maybe this salad can help make it so. Chickpeas - About 2.5 cups cooked. Mince your fresh mint and whisk into 3TB of olive oil in a little bowl. Drizzle in the honey while whisking. Add in the apple cider vinegar, and a pinch of salt, then set aside. Chop up all your veggies/fruit and have your harissa already prepared if making it. Heat up 1Tb of olive oil in a large skillet on medium heat. Add in your chickpeas. Cook for about 3 minutes stirring occasionally. Add in the 3TB of harissa and stir, distributing evenly. Cook for 2-3minutes. Add in two of the sliced apricots. Cook for another 2-3 minutes. Turn off the heat and stir in the last apricot, the red onion, olives, currants, and season with salt. 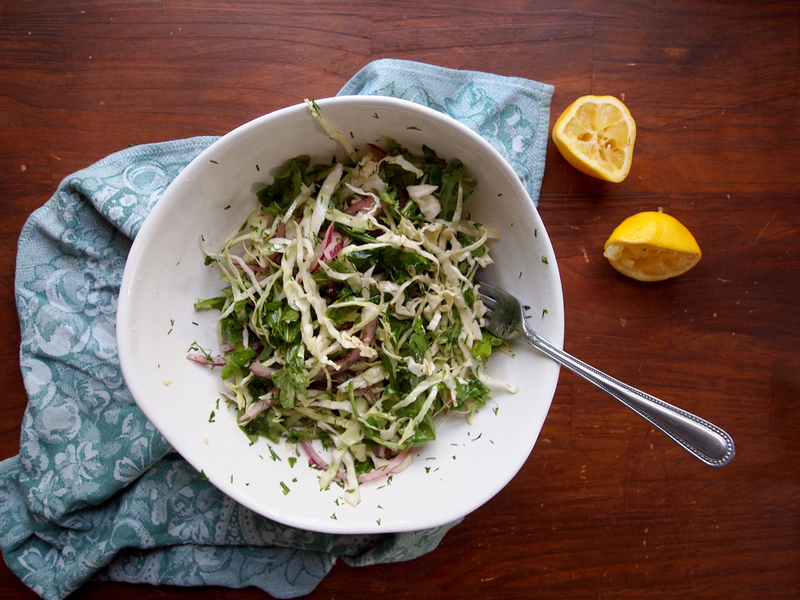 Toss the honey-mint dressing and your salad greens together in a bowl until the greens are evenly coated. Place on a platter and top with the chickpea mixture. Enjoy, it is a beautiful day. Harissa, you can add harissa into a lot of things. Hummus, sandwich spreads, marinades, dressings, etc. This recipe makes about 1 cup of harissa. Olive oil - 2-4TB, depending on your peppers/juiciness of peppers. Place all ingredients, starting with only 2TB of olive oil, into a food processor (or blender) and blend. Drizzle in more olive oil as needed. You want the consistency to be a thick paste but spreadable. Store in an airtight container in the fridge and use as needed. Keeps about the same as hummus. Spring fava bean, quinoa, radish, avocado, & mint salad. I am so excited. I'm going to visit my Athens tribe. We are approaching our Denver move date fast! We leave in about 2 weeks. Sure there is a ton to do... packing things up, cleaning, finishing projects, getting things ready for the sublease... but I'd rather go see my dear friends and family who, right now, are about 9 hours away. Come Denver we'll be 22 hours away. I feel this is an adequate reason to forsake responsibility. I'm getting some time with my family too before dipping out to the Rockies but I'm assuming my Dad will use my Denver location as a great excuse to finally come out and have some river time. I have lots of things waiting for me in Athens this weekend. Lets see, it is twilight weekend (an international bike race that has athens busting at the seam), there are drinks in the Georgia warmth awaiting, a dear friend who is just back in from teaching in South Korea, brunch with the best, oodles of dogs at dog park time, art school exit show (featuring one of my favorites), desserts (last time we racked up a bill of somewhere around 50 bucks on dessert between 5 of us... uhh what? ), a farmers market that I have missed, my best friends and all those lovely faces that I have so dearly longed for being tucked away up here in the mountains and of course no trip to athens is complete without music. So this week I've been being extra good. Drinking smoothes, eating raw salads, and taking my herbs. 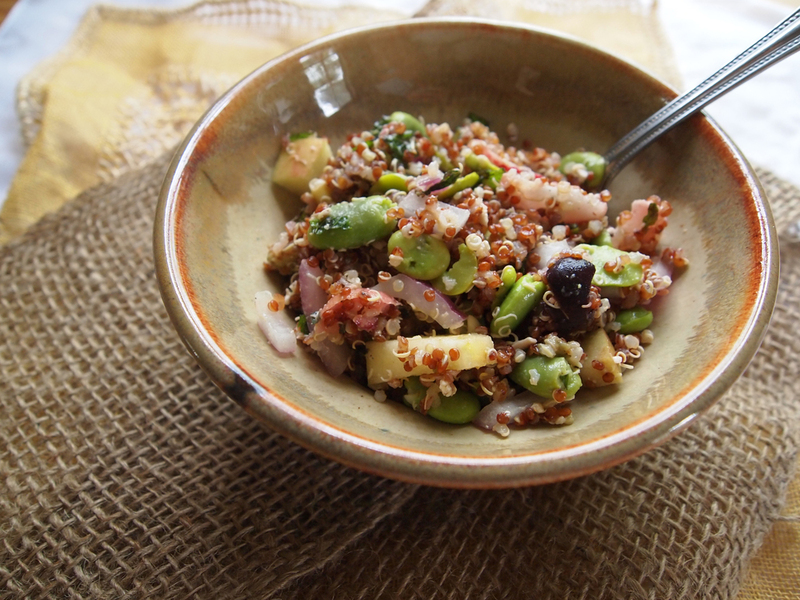 This quinoa, fava bean salad is ridiculously good. It is one of those meals that you think while eating it, "I could have this every-single-day of my life and be happy." It really is one of those meals that I think I could have every single day if I actually thought I could eat the same thing every single day. Olives - I had 6 kalamata olives left in my fridge, I sliced the meat off the pit into slivers. Chop everything up so it is ready to use, except your avocado, save that until the end. Rinse the quinoa in a sieve under water while shaking for a minute. Then add the quinoa into a medium pot and cover by a few inches of water. Bring the quinoa up to a boil and simmer for about 10-15 minutes. Get another small or medium pot out and fill it up half-way with water, this will be to blanch your fava beans. Shell the fava beans and place the beans into a bowl, discard the pods. Once the water is boiling, add in your fava beans and let it get back up to a simmer. Once it gets back up to boiling, don't let it cook longer than 1 minute. Drain the fava beans and rinse with cold water. Here comes the tedious part. Shell the fava beans and discard the shell, underneath will be this bright, green bean. Once you are done with the quinoa and fava beans, you can put them into a large bowl together. Heat the oven up to 350 degrees. Chop up the radishes into thin slices. Add 1/2 the radishes into the bowl with the quinoa & favas. Add the other 1/2 the radishes into a small saucepan on the stove with the 1TB butter. Heat over medium heat and stir until melted. Season with salt and pepper. Transfer the radishes to the oven and cook for 10 minutes. Meanwhile add the apples, mint, feta, olives, onion, lemon juice, and drizzle of olive oil to the bowl of quinoa. Stir until well combined. Slice up your avocado and set it aside. Add in your roasted radishes and season with whole thing with salt and pepper, you should not need much salt. Add in your avocado last and stir, gently, until well combined. Enjoy it, I know you will. Why? Because it is just that good. After sorrows such as Monday's there are few things I feel like doing, cooking especially, and most likely most of the country is with me. I huddle on the bottom of the tub with my knees hugged to my chest with the warm shower flowing over my head, crying. I ask over and over why; everyone asks why. We keep asking because there is no way to comprehend it, it is so against human nature. Not only this event, but all of them in our country, in other countries. None are more tragic than another. We are so compelled to find reason in the madness. Some way to understand the hate and violence. There is so much violence all around the world fueled by hate, terrorism, sexism, racism, politics, and none of the tragedies from these crimes ever leaves us. Sometimes we forget tragedies that happen to our brothers and sisters around the world until something like this happens so close to home. But really, no matter the reason why, there is no way to understand it. It doesn't make sense. There is no justification for such a horrid acts of hate. The only way to combat it is love. Love for the victims, love for the families, love for our community, love for our country, love for the world. Hearing the stories of love, empathy, and heroism that came out of the chaos is a bit of hope. Witnessing the true human spirit coming out to offer love and support and to hear the reactions and the responses of victims is amazing. I hope that people will spread the love they share with their neighbors and apply it to the rest of the world, we need it. It is the only thing that helps the soul heal and calm down. For all the hate and insanity from people in this world, there is more love. I made this salad last week. It takes me a bit to get back up and feel like cooking after all my emotions are drained. I hope you will enjoy it as much as we did. Yellow onion - 1/2, chopped. 1 package tofu - cut into small cubes and pre-pressed if desired. Peptias (Pumpkin seeds) - a handful. Heat your oven to 350 degrees. Trim off the ends, and chop up the brussels sprouts into slices or into 6ths. Place in bowl and toss with 2TB olive oil and salt/pepper. Spread onto baking sheet and bake in oven for about 20 minuets, tossing half way through. During the last 5 minutes, spread out the almonds on a separate pan and toast in the oven for the last 5 minutes. Meanwhile heat up a large skillet with 2TB of coconut oil on high heat (or olive oil, but in this case, on medium heat). Once hot add in your already pressed and cubed tofu. Toss in the oil and fry until crispy and golden. About 5-10 minutes. 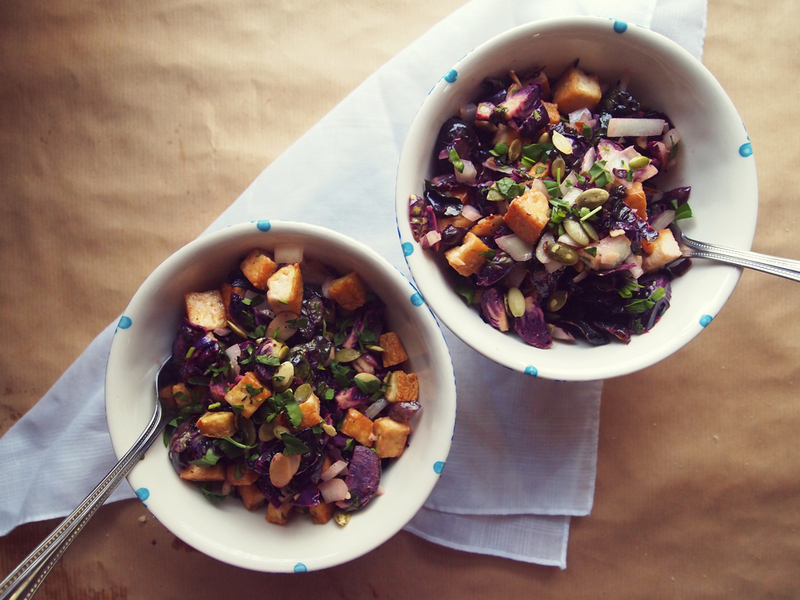 Once Brussels sprouts and tofu is cooked, toss together in a bowl along with the chopped onion, tarragon, toasted almond slivers, and pepitas. Whisk together the honey, dijon mustard, and white wine vinegar. Then slowly drizzle in the 1-2TB of olive oil while whisking until you have reached your desired dressing consistency. Pour the dressing over the salad and toss to combine. Lastly, squeeze over some fresh lemon juice, toss and distribute into bowls. If desired, top with a little extra tarragon. Last night I came back from a nice, warm, summer night out that started with listening to Brazilian drumming with drinks and ended with Thai curry. We arrived back home, parked the car in our semi-gravel/semi-grass driveway, I stepped out with my shoes in hand, feet on the earth, and just dead stopped; I was transfixed by the sky. The deep, midnight, blue sky was flecked so brightly with stars twinkling around the silhouettes of budding tulip poplar branches that seemed to arc over me. It was one of those instances where your whole body feels sucked in and swallowed by what you are paying attention to. Like the sky was a giant magnet pulling the top half of your body up many miles to meet with it. I would have given anything in that moment to reach up and cup my hands around each and every star and plant a big kiss on those bright star cheeks. I wanted to say thank you to the earth. Once spring finally hit us it stuck for one day and then immediately leaped to summer. When I moved a bit further north I thought I would be relieved to take a break from the suffocating heat of summer but now I realize how much I drink that warmth in. How replenishing it is. I wiped the literal sweat off my brow in relief at the return of heat. On an early April day of 90 degree heat I spent most of my day licking up the sun in my cutoffs and tank top while wandering around the woods in search of wild edibles. Successful in my venture, I made this salad and it never felt more nourishing than after a day in the sun. I realize now that as far as I move, as little or as frequently as I travel, I am some weird breed of southern girl. It's landscape, its sweltering humid heat, cicadas, common phenomenon of waving to strangers, fireflies, and biscuits are in my blood. Just as I adore and prefer to be in the woods and mountains, I have the salt and heavy air of the coast flowing through my veins since my birth. As much of a vegetarian as I am I have appreciation for a good seafood recipe and envy that I can't partake in a good shrimp n' grits or étouffée, it is the cajun in me. Some things you can't fight, its the soul speaking. I can't deny that even though I find some southern traditions and politics a little suffocating, I have love for the southern wild. I'm part of it and I will always find comfort in the return of the heat. 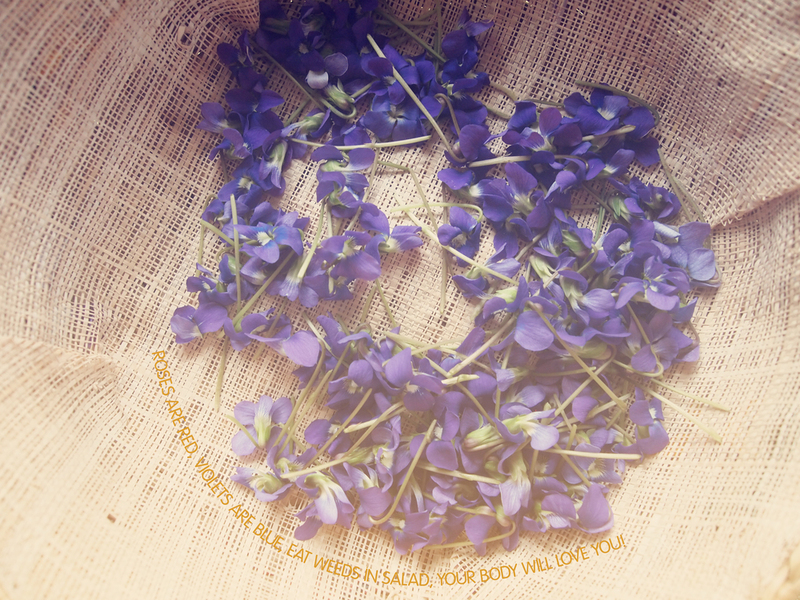 So thank you chickweed, thank you violet, thank you stars. Put everything in a blender or food processor (except the water) and blend. Then add water a few TB at a time to thin the dressing out to your desired consistency. oss the spring mix, onions, and violet flowers together. Then add in the dressing and toss to coat. Then add in the seeds and toss until combined! Adding the dressing before the seeds helps the seeds to stick and distribute more evenly rather than dropping to the bottom of the bowl. hickweed is one of those great common garden weeds that has so much overlooked potential. Chickweed is around you, I promise, and once you learn to identify it there is no reason not to thank it, pluck it up, and add it to your diet every spring. In short, chickweed is incredibly nutritious, I will elaborate on chickweed as an herbal superstar and healer in a later posting. Chickweed is a great source of calcium, magnesium, manganese, zinc, iron, phosphorous, potassium, Vitamin C, Vitamin A, Vitamin B-complex, beta-carotenes, and bio-flavonoids. I have heard the flavor being compared to corn silk. That is not my first thought when eating it but it tastes similar to most of the "moderate" flavors of light, cooling, spring greens to me. You'll find it in open (untreated) lawn areas but also in and around the edges to younger woodlands typically growing in the mottled shaded patches. It is really quite easy to spot once it is pointed out to you once or twice. There really aren't many overly close poisonous look a-likes but of course never eat anything if you aren't sure and always triple check your plants, but chickweed is a great starter wild edible. Chickweed is a low-growing, spreading radially along the ground about 3" tall typically, but it can get up to about 8" tall. It grows in mats up to a foot and a half in size with the leaves ranging from tiny to thumb sized. The leaves are oval, pointed, and opposite (meaning the leaves grow opposite each other on the stem). here are fine hairs on the stem of the plant and delicate white flowers at the end. The first time I looked at the flower I thought it had 10 petals but it turns out the flower only has 5 petals but each petal is so deeply cleft it looks like 10! Usually there are about 2-3 hairy flower buds drooping from the flower end as well. In addition, look up pictures online and familiarize yourself. Plus, if you are interested wildman steve brill has excellent books. Be sure to gather in areas that are not sprayed, are not exposed to a lot of road run-off, and are not a popular pet bathroom spot. iolet is another one of those lawn "weeds" that you probably already recognize. You know that tiny, delicate purple to white flower you have been admiring while walking along the sidewalk? Yeah that one, you can eat it. You probably have some in your very own yard as long as your lawn is untreated. Violet flowers and leaves are edible, not the roots or rhizomes, just stick to what is above ground. Also don't confuse native wild violet with the African violet house plants... you really don't want to eat those, they are poisonous. The leaves and flowers are great in salads but the leaves are very demulcent so a bit more slimy than your typical green. 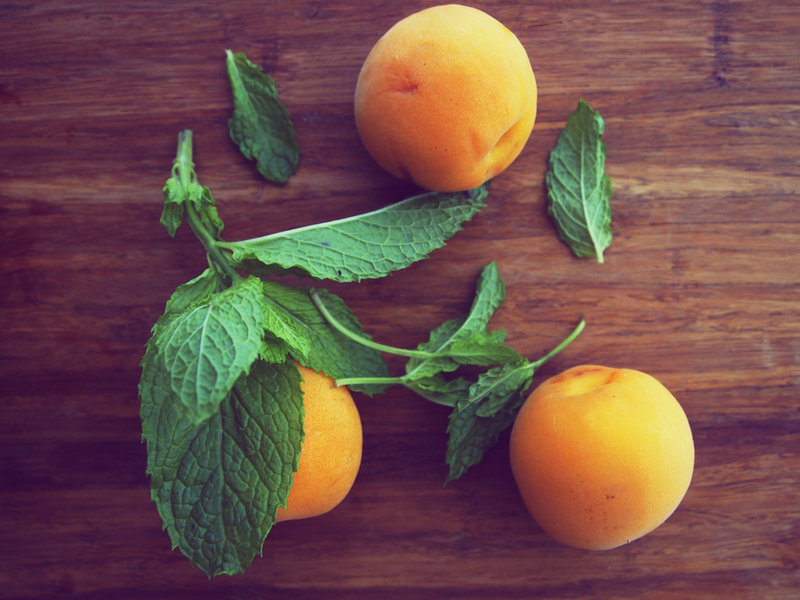 It is a fabulous cooling herb and rich in vitamin A, vitamin C, and beta-carotenes. It is another wonderfully healing herb which I will expand upon in a later posting. Violent is a low growing, dense, clumping plant. Its flower is five petaled with deep purple, blue, to white nodding flower heads. The flowers grow on a single stem with no leaves on the flower stem. The leaves grown on separate stems and are rather glossy, heart shaped with the "tops" of the hearts typically cupping inward towards the leaf stalk. Sometimes the leaves are cupped so far inwards that they create a funnel of sorts. Violet will grow in open lawn areas in sun to shade. Be sure to gather in areas that are not sprayed, are not exposed to a lot of road run-off, and are not a popular pet bathroom spot. 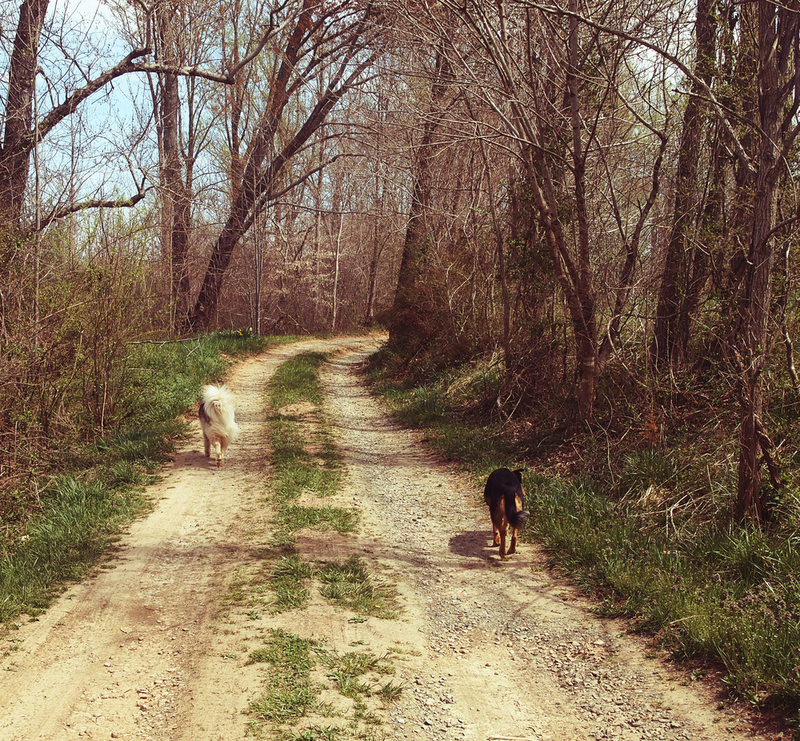 t the end of the day I had happy bellies and happy dogs. Potato salad is another one of those classic dishes that gets ignored. Or else we tend to think its only place is at bbq's and picnics mounded onto a plastic plate with equal parts mayonnaise and mustard. This is a fresh take on potato salad that gives you all the satisfaction of picnic fare, but with a better ingredient list. Red onion - 1/4 of a red onion, chopped finely. Fill a medium pot up with water to boil. Add in the potatoes and let them boil until cooked and are easily pierced with a fork. Drain potatoes and rinse under cold water. You don't want the potatoes hot to the touch, you want them slightly cooled. Mix together the sliced snap peas, red onion, dill, and salt/pepper. Stir until combined and then add in potatoes. Mash/chop with a fork very slightly and stir until everything is coated. Eat alone or served on a bed of greens. Spring is on the tip of nature's tongue here. I am ready for it. I am just itching to break into the delicate spring produce. Yet every time I start to thaw out and accept spring another cold front knocks on my door saying, "you seriously thought that dress didn't need a coat today?" I almost stubbornly produce shop seasonally (with a few exceptions). I love breaking into a new mini era of cooking depending on the season. Fall is heavily drenched in warming spices and squash, winter is for roots and bitter greens, spring for asparagus, sugar snap peas, wild foraging, and crisp spring mixes, summer for all things tomato, fruit, eggplant and, most importantly, ice cream. This dish is a great compromise between winter and spring. The crunchy, colorful satisfaction of radish, the sweet, acidic pop of late season blood orange with the hearty grains of winter turned creamy by goat cheese. Need I say more? I know I had you at radishes cooked in butter. Heat oven to 400 degrees. Place farro and 3 cups water into a small pot on low heat. Let cook until tender, about 30 minutes. Meanwhile, divide radishes from their greens. Cop radishes into quarters and cop radish greens into coarse chunks. Take out oven-proof skillet and melt butter on medium heat. Toss in radishes and cook for a few minutes. Add in about a tsp of chervil and season with salt/pepper (about 1/2tsp). Toss in radish greens and stir around until coated, about 1 minute. Transfer the skillet into the oven and roast about 15-20 minutes (depending on radish size) until radishes are softened and a little colored. While radishes are roasting peel blood orange with a knife following the curve of the orange. Cut out the wedges from white membrane of the blood orange and chop. Disgard orange membrane. Take out radishes out of oven and toss in a handful of arugula. Stir until just wilted from the heat of the pan. 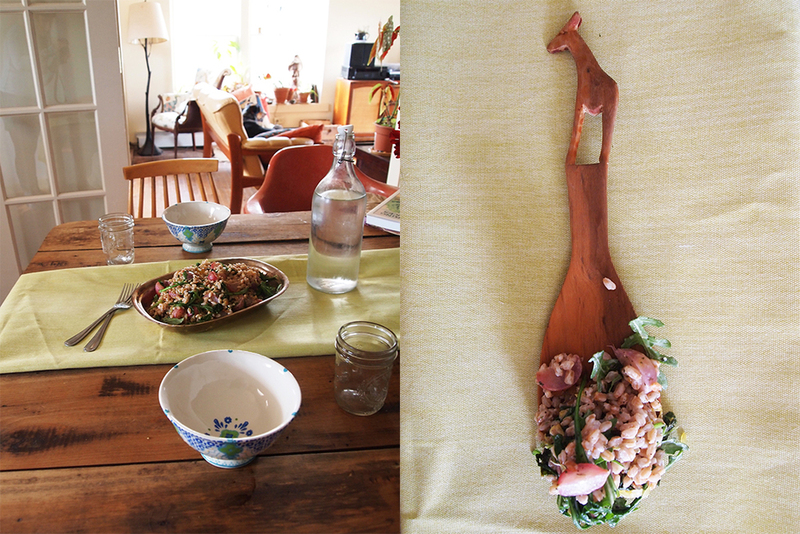 Toss radish mixture with the cooked, drained farro, blood orange, and another handful of fresh arugula. Crumble in 3-4TB of goat cheese and then stir to combine, the goat cheese will melt into the dish making it creamy. Taste and adjust with salt, pepper, and another few pinches of chervil. Enjoy over thoughts of spring. A well-composed salad is an art. Sometimes I succeed in this art and other times not as much. Sadly, too many people overlook salads on menus or at home because a traditional iceberg lettuce drenched in ranch isn't something special... or even good for you but, it is what the typical idea of a salad is. 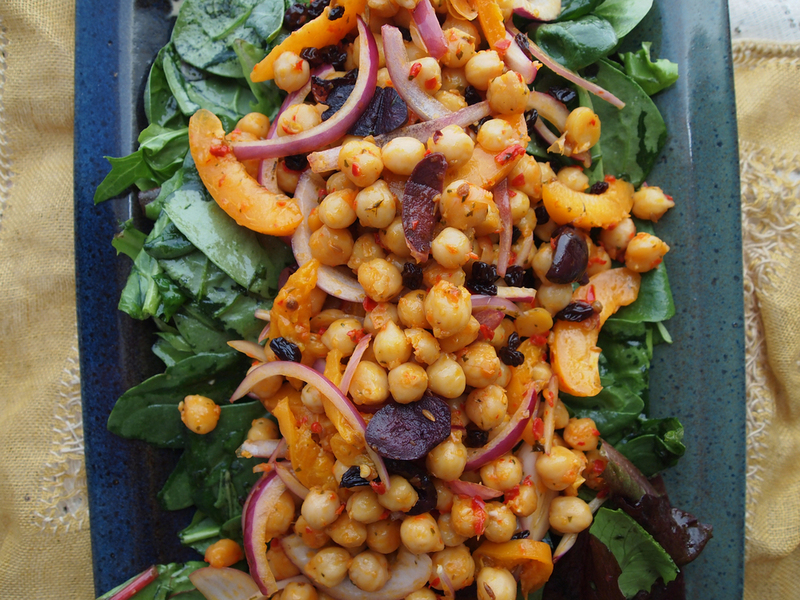 I love this salad and of course, like any salad, it is open to adaptation. Throw in some dried fruit or other nuts, add more roasted veggies, maybe some chickpeas or french lentils, change up the dressing, etc. I wish I would have had more than a half bundle of brussels sprouts at my house so I could have made more! I'm sure this salad will keep quite well in the fridge - great for leftovers if eaten cold. 1/2 bunch of brussels sprouts - rinsed and then the leaves peeled of from the head into "petals." Heat your oven to 350 degrees. Toasted your walnuts (takes about 5 minutes) and set aside. Peel the leaves off of each brussels sprout and place in a bowl. Toss with 1-2TB olive oil and about a teaspoon each or to taste of salt and pepper. Spread on a baking sheet and place into oven to roast for about 20 minutes. Flipping the brussels sprouts after 10 minutes. While this is roasting prepare your dressing and everything else. Dressing - whisk the Mustard, Honey, vinegar, 1TB olive oil together into a small bowl. Set aside until everything is ready. Once the brussels sprouts are roasted toss into a bowl and add the toasted walnuts, chopped red onion, salad greens, and parmesan toss. Drizzle over dressing and taste before adding all of it (in case you want to use less dressing - I used all of it). Toss. Squeeze over fresh lemon juice and toss until it is all incorporated. Enjoy and have a peaceful day.